Sometimes the best advice comes from others who have already walked in your shoes. That’s the premise behind a new eBook called “Henry’s Amazing Dog Cancer Diet“ by Buck Precht. When Buck’s beloved dog Henry was diagnosed with hemangiosarcoma more than a year ago, his prognosis was grim, but Buck refused to accept that his best friend would soon succumb to this aggressive form of cancer. So, he set out to learn as much as he could about the disease and natural ways that he could help Henry fight using diet and nutrition. This eBook was originally free to download when this post was first published in July 2011, but is now $25 if you are interested in purchasing it, visit: http://www.caninecancerdiet.com/, contains the results of Buck’s research and experience. The goal is to help other pet owners save time and energy by learning from his experiences and mistakes along the way, and to help more dogs like Henry beat the odds and live long past their initial diagnosis. Henry’s story is inspiring and this is a good resource for pet owners whose dogs have been diagnosed with hemangiosarcoma and have few options at their disposal. It provides hope and a solid starting point for developing a plan to combat this aggressive cancer. Clearly, the plan that Buck has designed for Henry has worked very well for him. However, as with ANY dietary changes or addition of supplements, please consult with your veterinarian or a holistic vet who can guide you and ensure that your dog does not have any coexisting conditions or risk factors that would make this regimen unsafe and to ensure that the ratios of ingredients are safe and correct for your dog. This diet has not been evaluated by a veterinarian or nutritionist and some of the ingredients used, especially Wormwood and Black Walnut Hull are VERY potent and potentially toxic substances if not used correctly, so please use this resource as a guide and a starting point, but talk with your vet before implementing this or any other diet and supplement plan. This entry was posted in Cancer Treatments, Diet & Nutrition, Resources and tagged canine cancer, canine cancer diet, dog cancer books, dog cancer diet, Hemangiosarcoma. Bookmark the permalink. Nothing free about the book at all. $25 is not free, and that’s steep for an eBook. If you click on the link in the first paragraph, it will take you directly to a.pdf of the eBook. They may be charging now since this post was originally put up last year, but the link towards the top of the page still works and gets you to the ebook without a charge. Hope that helps! this e book is not free, do you have a copy of the free one you would like to share? When this post was first published a year ago, it was free and the post included a link to the download page. Unfortunately, they are now charging $25 for the book and have removed the page to the link that I had posted. 😦 I’ve updated the post to reflect that and apologize for the confusion. It’s too bad that it is no longer an easily available resource for pet parents. 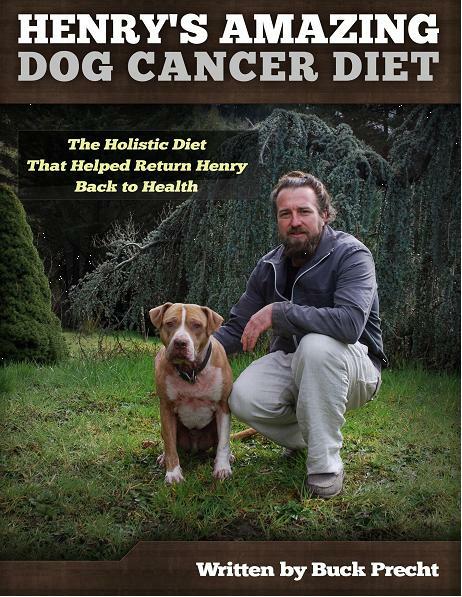 I have used this ebook and Henry’s diet with my eight year old golden retriever who had a cancerous tumor removed from her ear this past Christmas. It has only been nine months, but she acts like she is two….full of life, healthy and playful. A very different dog from a year ago. My six year old flat coat retriever also gets this diet (without the fish). She too is playful and healthy. I had the diet evaluated by my holistic and traditional vets. They both said it was fine. The only tweek they made was to add milk thistle, and to make sure there is enough protein in the diet for the active girls. I added a chicken patty from natures variety for both. The $25 seems steep, but it has bee very well worth it. The food freezes well too!